One of the most famous places in Iceland is the Blue Lagoon but it has become very touristy. In North Iceland, near lake Myvatn, you can relax in a more intimate version of the lagoon: The Myvatn Nature Baths. I went after a full day of visiting many incredible sites in the area and really enjoyed the relaxation. From Reykjahlid head East towards Egilsstadir on road 1. After three kilometers, turn right by the sign indicating the Baths and follow the road for 1 km. 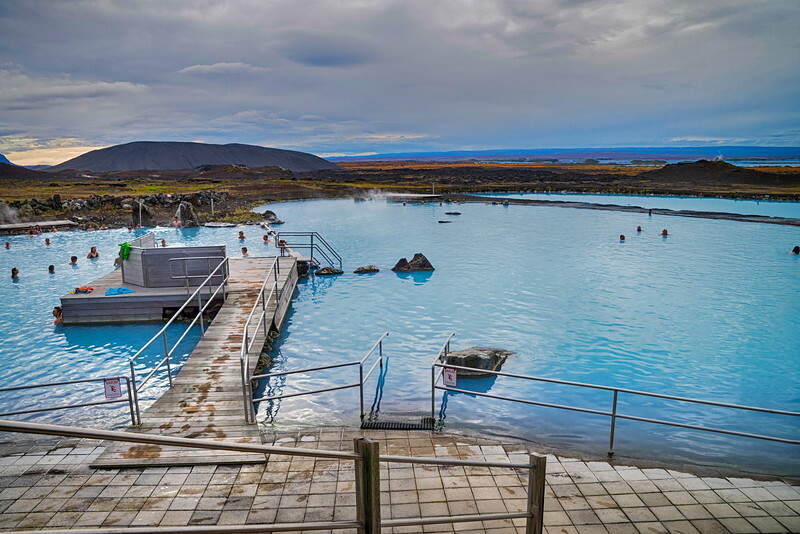 The Myvatn Nature baths also called Jarbodin are located in a geothermal area just east of the Grjotagja rift and west of the Hverir geothermal area. Throughout the history, the locals have used the natural stem of bathing by building a stone shelter over a fissure. The Nature Baths of Myvatn opened in 2004. The water supplied to the man-made lagoon is drawn from depths of up to 2.500 metres. contains a large amount of minerals, is alkaline and well suited for bathing. Due to its chemical composition, undesired bacteria and vegetation do not thrive in the lagoon making chloride or any other disinfectant redundant. The water has a temperature of about 130°C when it arrives to the surface but le lagoon is at a temperature of 36 – 40°C. Blue Lagoon or Myvatn Nature Baths? Most people visit the famous Blue lagoon but if you have a choice and travel to Myvatn, I recommend the Nature Baths. Here is a short comparison to help you decide which one to visit. Towels and bathrobes can be rented while purchasing your entry. You are allowed to bring in your own. I really recommend a stop to relax your muscles! My family are coming to Myvatn Nature bath tomorrow and I would like to know if you have anywhere private for my daughter to shower as she feels uncomfortable showering naked in front of everyone. I am not the Myvatn Baths company, just a blogger who traveled there. When I visited, as I wrote in the article, “some private showers with curtains are available”.